Hey! it's the Stratastation! 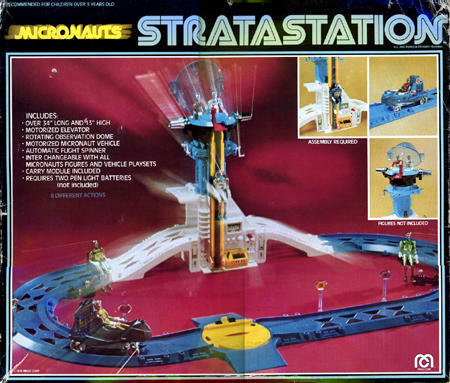 This is the first playset ever for the Micronauts, and certainly one of the coolest. The box photo almost seems Japanese in style rather than in sync with the rest of the Micronauts box art. The photo pretty much depicts everything that you get. This playset is by far the easiest of the playsets to put together. The track snaps together via an interlocking nodule on the ends. Everything else fits together just as intended. It takes a whole 2-3 minutes to put this baby together, unlike the Mega City which takes days, years, an eternity! The "Includes" list makes mention of a "carry module", but I have yet to discover what that actually is or if it was really included.